At this time of year, people may have noticed quite a change in bird numbers in the local area. This starts as early as late January when some birds have finished nesting and move elsewhere in search of suitable feeding grounds. Of these, perhaps the most noticeable is the drop in numbers of Superb Parrots that are such a delight to see from September over the Summer when they can be seen in large flocks of 20 or more birds in Narrandera and Leeton in particular but also at times even in Griffith. These birds breed in the River Red Gums which provide plenty of nesting hollows all along the river. 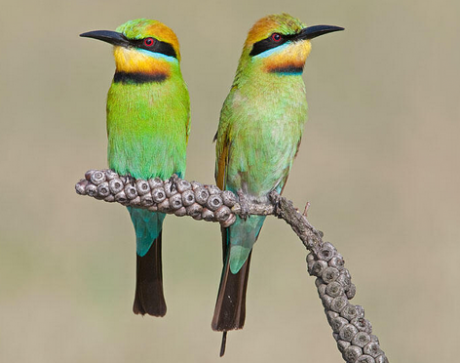 Another very recognisable bird is the Rainbow Bee-eater that return in numbers in Spring to breed locally. They are a migratory species that spread south in the Summer and return at this time of year to the north. During winter there are no Bee-eaters seen locally but they are still found in southern Queensland from around Brisbane northwards all year round. Most, however, cross the Torres Strait from late March and spend the winter in the islands north of Australia. At this time of year large flocks can be seen heading north along the Queensland coast and Northern Territory. Even, here in early March it is not unusual to see flocks of 20 or more Bee-eaters at the one location and yet if you go back the next day they have disappeared! Not nearly as common, yet reasonably easy to see along river banks in Summer is the Dollarbird. This bird, like the Bee-eater is a Summer visitor and they have already moved north after breeding locally. Not always easy to see but when feeding young in the nest they are extremely vocal and can be easily seen hawking over the river for insects. Other birds to depart for more suitable winter habitats but do not leave our shores are White-winged Trillers, Brown and Rufous Songlarks, Mistletoebirds, Sacred Kingfishers and even Corellas. When birdwatchers visit the area in winter, it is not easy to locate these birds locally – some do stay but most leave for other areas where their food source is more reliable. Finally, another noticeable sign in bird activity that winter is approaching is the opposite to migration but more the regrouping of the ever-present common species like Galahs and Magpies. These birds are seen in flocks at this time of year but usually pair off in the Spring to breed and don't associate in large social groups like they do over winter. Now it not unusual to see flocks of 60 or more Galahs feeding on the ground in the early morning and late afternoon or perched in trees in large groups during the middle of the day.